Amazing! A top quality 3 bedroom villa with 2 bathrooms, a garage, a swimming pool and stunning views! 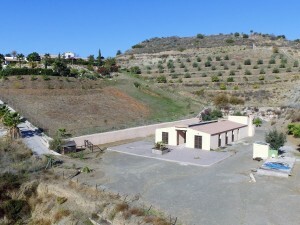 Located just a short walk to the town of Arboleas. This fantastic villa really is a must view! It is located in the popular yet quiet area of Arboleas. It is only a 20 minutes walk to the town and just a few minutes in the car. The property layout in a L shape and it's completely walled and fenced. The garden is laid with gravel and artificial grass for very easy maintenance, there are many different trees, plants and shrubs. The pool area is terraced and there is plenty of room all around for sun loungers around the pool. To the front of the property there is a spacious covered terrace which can be closed with retractable awnings with views over the pool area and the mountains. The main door leads into the very spacious fully equipped kitchen. From here a door leads into the huge lounge with a log burner and air conditioning. From the lounge double terrace doors lead to the covered terrace. A hallway from the lounge leads to two great sized double guest bedrooms with fitted wardrobes and ceiling fans, a family bathroom and a spacious master bedroom with an en suite shower room, air conditioning and an electric wall radiator. Next to the house there is the spacious garage with an electric garage door. The garden and the property are perfectly maintained! Ready to move in! Extras: safety bars and fly screen all around the property. All rooms are spacious.